Before flying off at this year’s Official Selection to Hawaii International Film Festival (HIFF), the Nova Villa-Freddie Webb onscreen reunion, “1st Ko si 3rd” will open exclusive at Ayala Malls Cinemas nationwide starting November 12. 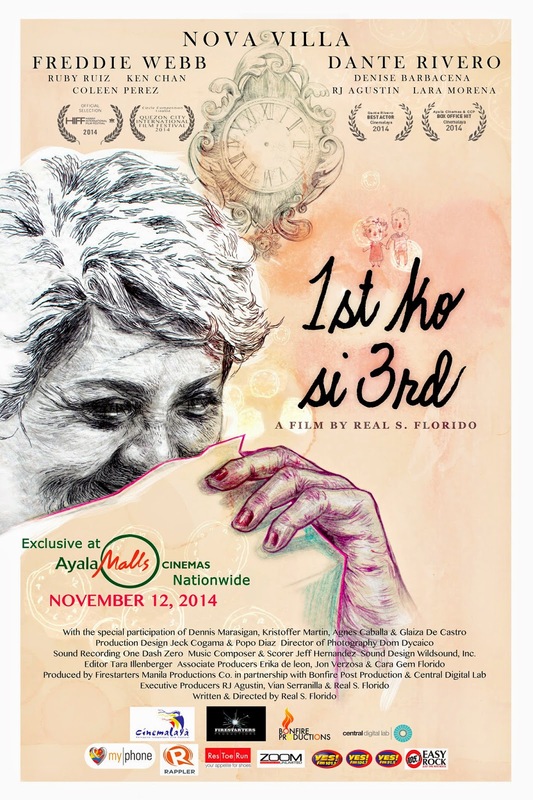 Written and directed by Real Florido and included in the New Breed Category of this year’s Cinemalaya Indpendent Film Festival (Year 10), “1st Ko si 3rd” introduces the audience to a 65-year old woman, Cory (Villa) married to Alejandro (Dante Rivero) who gets reunited with her 1st love, Third (Webb) and finally the supposed 1st date happens five decades after they got separated. Nova Villa, Dante Rivero and Freddie Webb , compleat actors round up an amazing endearing cast in “1st Ko si 3rd.” The movie pans on the first day of her retirement, 65-year-old Cory busies herself by cleaning her house until it was immaculate and spotless. Still, something does not feel right. 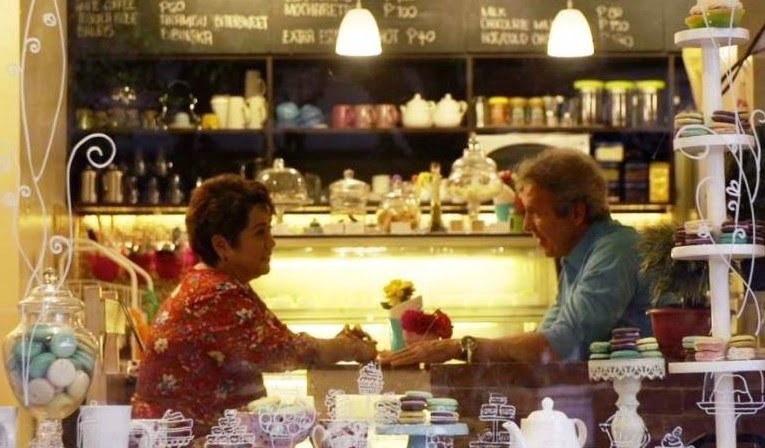 She is not used to the silence and to spending every waking hour with just her husband, Alejandro. She wonders if this is all she is to do and can expect for the rest of her life, after spending a good deal of it working so hard. Alejandro notices the changes in Cory. Their fights seem to be a side-effect of Cory’s retirement. Now that she is no longer working, she feels useless as a person and worthless as a woman. Then unexpectedly, Cory bumps into Third, her first love. Third was the first man who made her fall in love deeply. He was her teenage dream. She cannot forget Third because their first date never happened. Try as she might, Cory is almost bursting with happiness seeing Third again. 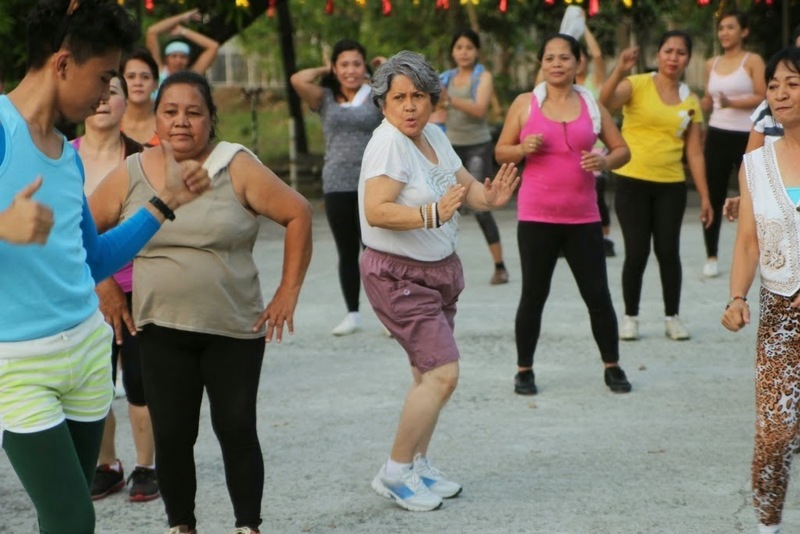 Her life suddenly becomes more colorful and exciting as she realizes she can spend her days doing things she never had time for before –learning to chat in the Internet, do idle talks with newfound friends, pamper herself at the salon and do aerobics. Life is definitely looking brighter, especially when Third asks her out. Finally, their first date is about to happen. Cory brings with her a handful of love letters she never gave to Third, kept all through the years they were apart. She is now ready to give them to her first love. On the day of their first date, Cory will realize what is lacking with her relationship with Alejandro as she discovers if “first love never (really) dies”. Real Florido grew up in Caloocan City, a densely populated area in Manila, which inspired him to do his 1st short film “Like A Broken Phonograph”—an official selection to the 4th Chicago Fil-Am Film Festival and film in competition in the 9th Cinemanila International Film Festival. While finishing bachelor’s degree in Mass Communication as a full scholar in the University of the City of Manila, he managed to get a job or two in different production outfits as assistant and project manager. Shortly after college, he got an assistant director job for ICU BED #7, a film that competed in the 1st Cinemalaya Film Fest. He later worked full time as writer and content producer for GMA 7, a leading broadcasting channel in the country. He was able to finish cinematography class at Mowelfund Film Institute and made another short film, “Mr. Perfect” that won 3rd place in the 180 Microcinema Film Festival and one of the Supreme Films in the Shoot4Life Filmmarathon Competition in Budapest, Hungary. Read our movie review for “1ST KO SI 3RD” here.